Pokhara is a beautiful town on the shores of Phewa Lake, with usually mild and sunny weather. We highly recommend that our guests spend a few days here, ideally following the trek, to rest and recharge. Pokhara offers excellent food, in a relaxed and beautiful setting. All along the lake, there are coffee shops and restaurants. We recommend checking out Tripadvisor, or just taking a walk and finding a place you like. Jiva Cafe & Spa is one of our favourite places for enjoying delicious and healthy breakfast or lunch by the lake, or just some tea or coffee. Their massages are fantastic! A great place to come the day after you finish your trek. We also enjoy OR2K for their excellent food and beautiful views over the lake. Pokhara is an adventure destination, offering paragliding, rafting, zip lining, and more. You can make arrangements with one of the adventure shops along Lakeside. Hiking or driving up to the Shanti Stupa is worth it when you are in Pokhara. The view of the mountains and lakes is stunning, and the atmosphere at the temple is very serene. Rent a boat with boatman and take a tour on the lake. Seeing Pokhara and the surrounding hills and mountains from here is a treat. This cave and waterfall are worth seeing. They offer a glimpse into Nepalese culture, and showcase this beautiful natural waterfall. 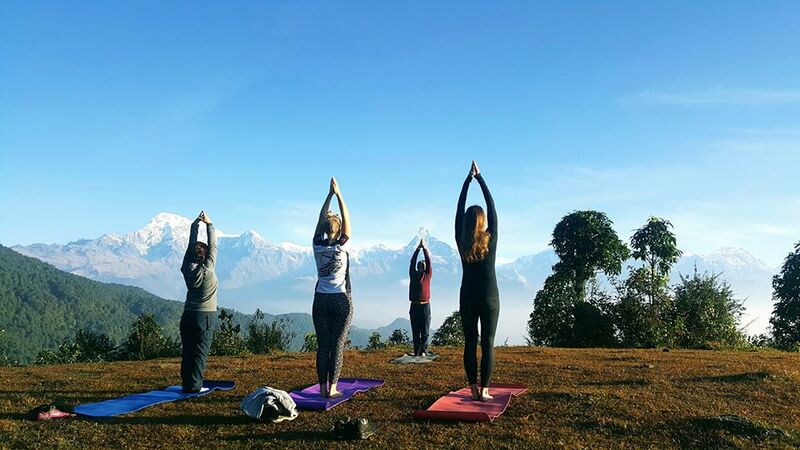 And of course, if you have not booked with us yet, we highly recommend that you embark on one of our yoga treks for a unique and transformative experience — most of our routes start and end in Pokhara. 🙂 See our testimonials here. What are your favourite things to do in Pokhara? Let us know in the comments! What information will we require from you upon booking and before the trek? How did you hear about Kamala Yoga Nepal? Emergency contact name and telephone number / What is their relation with you, friend, parent, sibling, spouse? Is a Yoga Trek with us the right holiday for you? … you would like to experience stunning natural surroundings while practicing mindfulness. … you would like to challenge yourself and are not afraid to step outside of your comfort zone. … you are sincerely interested in practicing yoga and meditation with us. … you are curious about Nepali food and culture and would like to experience both. [Read more…] about Is a Yoga Trek with us the right holiday for you? Which Yoga Trek Route is right for you? Several factors need to be considered when deciding which Yoga Trek route to choose: it depends on the number of days you have available, your level of fitness, the season during which you are travelling, and the kind of experience you would like to have. One of the unique things we offer at Kamala Yoga Nepal is that we offer shorter and longer versions of most of our treks. We know that our guests usually have a relatively set number of days available and we have tailored our offering in order to be able to offer something to everyone! [Read more…] about Which Yoga Trek Route is right for you?